We’ve spent many years testing donation form designs to determine what converts the most donors, and we have it down to a science. CommitChange takes all of the guesswork out of donation form optimization by including all of our best practices, and many years of extensive A/B testing. We know exactly how many fields to present at any given time, how many donation options convert the most donors, how to minimize anonymous giving, and much more. You can take advantage of all of our hard work — and we’ll even share what we’ve learned through helpful articles and one-on-one training sessions. Thurston County Food Bank is one of the largest food banks in the South Puget Sound, and one of CommitChange’s first nonprofits; they provide meal assistance programs for thousands of individuals and families in their community and operate on very small margins. After implementing CommitChange they increased their online giving by over 600% — allowing them to feed more people, hire additional staff, and ensure the longevity of the organization. They are currently taking advantage of CommitChange’s recurring giving features to generate sustainable monthly revenue, and also giving donors greater control over their donations by allowing them to select from a range of fundable programs. We’re proud to be their partners! Your Nonprofit profile is a portal for your donors. Your supporters can donate directly through your profile to support your cause. Create different crowdfunding campaigns and host events. Stripe processes credit cards for 2.2% + $.30 per donation. 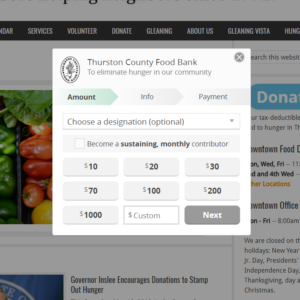 Create your own donate button or donation processing form to embed on your site with our simple step-by-step wizard. Customize your donation widget, link to thank you pages, and send custom receipts. Mobile friendly and rigorously tested to increase donation contributions! Our software will manage your nonprofit’s donation data with a searchable and intuitive dashboard for all of your donation records. Request a demo to learn more about managing donor relationships more effectively. SOIL, an innovative, ecological nonprofit working in Haiti, used CommitChange to create a page on their website to raise $10,000 in monthly recurring donations. Their form are never redirected away from the page, keeping them close to the content that inspired them to donate.